Celebration: From left|! !| Coca-Cola Chairman & CEO Muhtar Kent|! !| Atlanta Mayor Kasim Reed|! !| Gov. 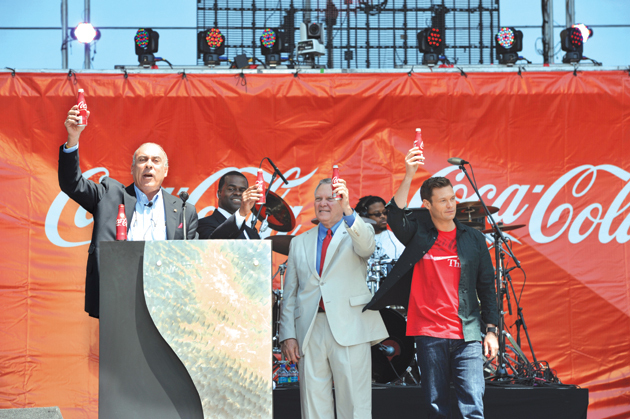 Nathan Deal and Ryan Seacrest toast 125 years of Coke. If you are alive today, odds are that Coca-Cola has always been part of your personal backdrop. It is the best-known brand in the world, its iconography the most instantly recognized pop-cultural set dressing from America to Zimbabwe. Born and raised in Atlanta, Coke has been “the real thing” for 125 years and remains Georgia’s most profitable company (netting $11.8 billion in 2010). Coke has added life. It has been “the great national temperance beverage,” “ice-cold sunshine,” “the best friend thirst ever had,” and “America’s Real Choice.” It has been subjected to some of the best marketing schemes (including the slogans above) the corporate mythmakers could conjure, and some of the worst (New Coke – ‘nuff said). But these slogans and schemes are only subtitles for a logo that has stood the tests of time (and attention spans) since Atlanta druggist John Pemberton created the soft drink and his accountant Frank Robinson named it Coca-Cola and hand wrote the Spencerian script logo that connects the 2011 version of the company to its roots in 1886. “That script is one of the things that define this company and the brand, and to think something as valuable as that was created by a bookkeeper, not a marketing genius. So, for 125 years, that logo has remained the identifying mark for the brand,” says Phil Mooney, who charts the history of the company’s growth as director of Coca-Cola’s archives department. “Our role here is to capture the ongoing history of the organization, and that essentially is the advertising and marketing assets of the company, because that’s how the consumer sees us. The man is correct. I remember the commercials, the slogans I’ve loved and the ones I didn’t care for, the toys and calendars and other promotional merchandise emblazoned with Coca-Cola, the paintings of Santa Claus – the real Santa Claus – drinking a Coke. Mooney is all about that stuff, the stuff that helped sell soft drinks and insert Coke into our social DNA. The company may be stretching it a tiny bit with their latest battle cry: “Life Begins Here” suggests images of Adam and/or Eve taking the pause that refreshes, holding the famous 6.5-oz. contour bottles. Mooney says, “A lot of people think the bottle mimics the female shape, and it’s been called the Mae West bottle. It’s also been called the hobble-skirt bottle, because it looks like a woman’s skirt. It certainly re-sembles that shape.” But the bottle was designed that way (in 1915) so that it would have a distinct look and feel – so when you saw it somewhere, or when you were poking around blindly in a vat of ice, you knew exactly what it was. The bottom line is, “Life Begins Here” creates mental images of Coca-Cola and its classic shapely bottle to a man who has already quoted the slogan twice in the span of a few paragraphs just to make a point. Score another one for the soda pop company on North Avenue. Mooney knows from Coke bottles. So does the rest of the world, apparently. “They introduced this contour bottle, patented it immediately, and it changed the game, because now you’ve got a package that is proprietary to your system, something no one else can use,” he says. The bottle also happens to be a very popular item among the massive community of Coca-Cola collectors. “I’m a bottle collector. I love bottles,” says Steve Brumbelow of Snellville. He served on the executive board of The Coca-Cola Collectors Club, which has chapters all over the U.S., Canada, Australia, Scandanavia and Spain. They’re widespread, Brumbelow says, because it’s an affordable hobby. It’s affordable because there is a staggering amount of stuff out there. Go to any flea market. Go to eBay, do a search for Coca-Cola collectibles and you get 41,000 listings (there are bids as low as a penny for labels and bottle-caps and a suggested bid of $200,000 from someone selling a rare misprinted bottle). Mooney understands perfectly. He is a trained historian who has been in charge of the company’s collections since 1977, the Indiana Jones of soda pop – obtainer of rare Coke antiquities. When the Schmidt Museum of Coca-Cola Memorabilia in Elizabethtown, Ky., auctioned off part of its collection in September, Mooney was there. Among the items that are coming to Atlanta, probably to the World of Coca-Cola, is a 1949 delivery truck. “We’re always looking. We’re always checking leads,” says Mooney, who has hope that the three missing Norman Rockwell paintings will turn up one of these days. Coke always had one of them. A former employee returned another after keeping it in his home for decades, and in 2001 a retired executive from the Kentucky printing company that made Coke calendars called Mooney out of the blue one day. “He said, ‘I have this Norman Rockwell painting, and maybe you guys would love to have it,’” Mooney recalls. The company bought the painting, which was probably worth about $500,000 on the open market, for an undisclosed sum. One of the Rockwells hangs in the office of Coca-Cola CEO and Chairman Muhtar Kent. The other two are in the World of Coca-Cola, which also displays Mooney’s personal favorite artifact. The bottle has captured the imagination of artists as well as collectors. It was a favorite subject of folk artist Howard Finster, and one of Andy Warhol’s Coke bottle paintings (black and white on canvas) fetched $35 million in auction at Sotheby’s last year. The history of the Coke bottle, of Coca-Cola bottling in general, is the story of American progress, of one corporation’s exponential corporate growth. For the first 13 years of its existence, Coke was strictly a soda fountain business. Then Asa Candler, who bought the company from Pemberton, sold the rights to bottle the drink to a couple of Chattanooga businessmen (for $1), and that changed everything. “Once you have it in bottles, you can move around, you’re not confined to an outlet, you have the capability of moving your product around,” Mooney says. At one time, before massive consolidation, there were 1,100 bottling plants just in the U.S.
Bottling plants started opening outside the U.S. in 1906 (in Canada, Cuba and Panama). But it was Robert Woodruff, who became company president in 1923, who really extended Coke’s worldwide reach. Woodruff also had 64 bottling plants built in Europe, the South Pacific, North Africa and parts of South America during World War II, serving about five billion bottles of Coke to U.S. troops. The planet was wide open for a soda invasion. In the 1950s, guided by Woodruff’s vision (he stepped down as president but remained on the board as the de facto head coach), the company opened about 15 to 20 plants a year around the world. Through the 1950s, the company just made cola (or rather, it made concentrated syrup and sold it to licensed bottlers, who would add water and other ingredients, then put it in bottles and sell it). Today there are roughly 500 brands in the Coke system worldwide (sodas, juices, coffees, water and so on, all of it nonalcoholic). Last year, The Coca-Cola Company bought the North American operations of Coca-Cola Enterprises for $12.3 billion, bringing the largest single bottler into the corporate fold in an effort to cut supply chain costs and create new revenue opportunities. Mooney says Coca-Cola is sold (legal-ly) in every country except Myanmar, North Korea and Cuba, where one of the first overseas bottling plants opened more than a century ago. So Coca-Cola is recognizable in every corner of every place, and the company pays handsomely for its omnipresence – almost $3 billion on advertising last year. That’s a lot of scoreboards and stadiums and sponsorships (Coke sponsors the world’s biggest sporting events, the World Cup of Soccer and the Olympic Games). It’s all over your TV, your radio, your computer (the Coca-Cola Facebook page has 34 million fans). It is in movies, sometimes as product placement, sometimes for free, like a gift from the gods (both a gift and a curse, actually, in The Gods Must Be Crazy). If Coca-Cola had a holy trinity, Mooney believes Woodruff would be the Godfather, with Candler and Roberto Goizueta, Woodruff’s protégé, and the namesake for Emory’s business school on either side. “Goizueta was a game-changer; the stuff he did was groundbreaking,” Mooney says. He introduced Diet Coke (the No. 2 soft drink in the U.S., after regular Coke and ahead of Pepsi). He introduced the caffeine-free sodas and the first flavor extensions (Cherry Coke). Of course, he also was the driving force behind New Coke in 1985. “But he was smart enough to quickly realize we’d made a mistake,” Mooney says. Within a few months, after consumers basically rioted in the streets, the so-called secret formula was reintroduced in Coca-Cola Classic, and New Coke gradually disappeared over the next several years (“Classic” was dropped from the red labels of regular Coke a couple of years ago). Goizueta would be forgiven and lionized by the time of his death in 1997, after 16 years in charge. But for years, conspiracy theorists believed he had engineered the whole New Coke fiasco as a brilliant marketing scheme designed to revitalize interest in the original formula. They just didn’t take into account the emotional attachment people had with their soda, an attachment bordering on deep and abiding faith, or fervor, which is something Goizueta came to appreciate. Goizueta would probably be pleased to know that in 2011, yesterday morning was 1.7 billion Coca-Colas ago. As for this morning, well, it’s early yet.